This project addressed barriers experienced by nursing staff when using the Malnutrition Screening Tool (MST), by introducing staff education, streamlined education pathways and a cheat sheet for nursing staff. To ensure that 100 per cent of malnourished patients in the Medical Ward of South East Regional Hospital (SERH) are appropriately referred to the Dietetics Department using the MST, within six months. Reduces adverse outcomes and healthcare costs associated with malnutrition. Identifies and addresses barriers to nutrition screening and provides direction for future initiatives. Fosters a workplace culture where nutrition screening is seen as a priority. Improves the patient experience, by helping nurses identify patients at risk of malnutrition in a timely manner. Improves the efficiency and cost effectiveness of the Dietetics Department. Redirects resources to other activities, such as ongoing education and support to nursing staff. Enhances collaboration between nursing staff and dietitians. Since relocating to SERH in March 2016 and transitioning to electronic medical records (eMR) in July 2016, the Dietetics Department at SNSWLHD had increased demand for its inpatient and outpatient services. Occasions of service increased from 214 to 433 per month in the following 12 months, despite dietitian staffing levels remaining constant. This increase was largely due to the introduction of the MST in eMR, which measures patients’ risk of malnutrition on admission and at various stages of their hospital stay. Nursing staff use the MST to assess weight and appetite loss, then give the patient a score between zero and five, depending on their nutrition risk. If the patient receives a score of less than or equal to two at any time, the eMR generates an automatic referral to a dietitian. Timely nutrition screening is vital for identifying patients who have a high risk of malnutrition and gives dietitians an opportunity to treat the patient in a timely manner. 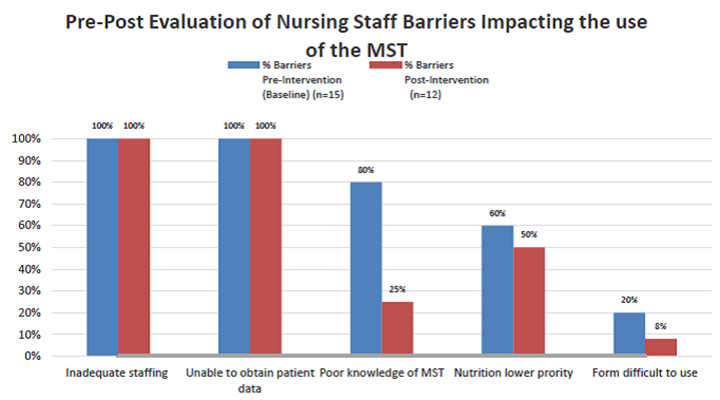 Prior to the project, nursing staff identified a number of barriers impacting their ability to complete the MST with every patient. These included inadequate staffing, an inability to obtain patient data, poor knowledge of MST, a perception that nutrition was less important than other nursing duties, and difficulty with using the form. 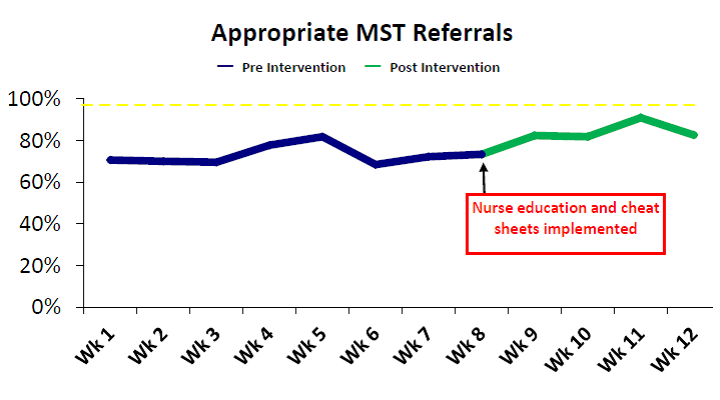 This led to variances in MST scores between staff, inappropriate referrals to dietitians and additional strain on the already stretched resources in the Dietetics Department. As a result, there were missed opportunities for early intervention and many patients who required a consultation with a dietitian were not being seen. Monthly training for all nursing staff on the Medical Ward was introduced from March 2017. This included shift workers, agency staff and student nurses. The training covered the benefits of nutritional screening and how to use the MST. 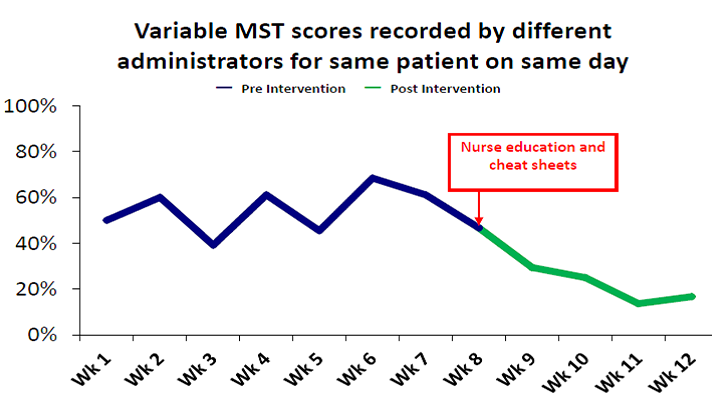 The MST on the Waterlow Assessment Form was linked to the automatic referral system in eMR, to improve the referral pathway. A cheat sheet for using the MST was developed and placed on all computer workstations in the Medical Ward. A copy of the cheat sheet was also emailed to all nursing staff, alerting them to the resource. The following solutions are currently in development and will be implemented in 2017. A nutrition screening protocol will be developed for use on the ward. MST forms will be standardised in eMR. This solution is awaiting feedback from the Application Advisory Group on the proposed changes. All MSTs will be completed by an Allied Health Assistant in the new Sub Acute Rehabilitation Unit, once this unit is opened at SERH. A mandatory MST training module will be developed for the Health Education and Training Institute and undertaken by all nursing staff. Monthly meetings for nursing staff and dietitians will be established, with the aim of providing ongoing support, troubleshooting issues and creating a culture where nutrition screening is seen as an integral component of patient care. Staff shortages caused delays to the project and as a result, solutions have not been implemented over the proposed six-month time frame. The number of malnourished patients who were appropriately referred to the Dietetics Department using the MST increased from 71 per cent in January 2017 to 83 per cent in April 2017. A weekly audit was conducted on the medical ward over a 12-week period from January to April 2017, to identify variances in MST scores for the same patient on the same day. Results showed that variances reduced from 50 per cent in week one to 17 per cent in week 12.
difficulty in using the form was reduced from 20 per cent to 8 per cent. Post-intervention feedback provided by nursing staff in focus groups and surveys in April 2017 showed that nutrition was still perceived to be less important than other nursing duties. Comments from nursing staff included the following. A full evaluation of the project will take place in August 2017 and if successful, will be rolled out to all other wards at SERH. Strong communication and adequate staffing levels are critical to the success of the project. Staff shortages caused delays to the implementation of this project, as well as the development of some solutions. To address this, the timeline of the project was extended and the final evaluation postponed until the current solutions could be implemented over a six-month time frame. Barker LA, Gout BS, Crowe TC. Hospital malnutrition: prevalence, identification and impact on patients and the healthcare system. International Journal of Environmental Research and Public Health 2011;8(2):514-27. Ferguson M, Capra S, Bauer J et al. Development of a validated and reliable malnutrition screening tool for adult acute hospital patients. Nutrition 2000;15(6):458-64. Hamilton C, Boyce VJ. Addressing malnutrition in hospitalised adults’. Journal of Parenteral and Enteral Nutrition 2013;37(6):808-15. Porter J, Raja R, Canta R et al. Exploring issues influencing the use of the Malnutrition Universal Screening Tool by nurses in two Australian hospitals. Journal of Human Nutrition and Dietetics 2009;22(3):203-9. Skipper A. Agreement on defining malnutrition. Journal of Parenteral and Enteral Nutrition 2012;36(3):261-2. Skipper A, Ferguson M, Thompson K et al. Nutrition screening tools: an analysis of the evidence. Journal of Parenteral and Enteral Nutrition 2011;36(3):292-8. White JV, Guenter P, Jensen G et al. Consensus Statement: Academy of Nutrition and Dietetics and American Society for Parenteral and Enteral Nutrition: Characteristics Recommended for the Identification and Documentation of Adult Malnutrition (Undernutrition). Journal of Parenteral and Enteral Nutrition 2012;36(3):275-83.